If you're considering starting a business and love the outdoors, you can make a good living as a home-based gardener. You may want to consider this career if you have a green thumb and enjoy working with plants and flowers. 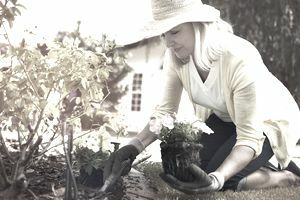 Gardeners perform many tasks, including watering, trimming, raking, digging, planting, hoeing and leaf-blowing, to keep their customers' homes and yards looking beautiful. Although little or no experience is necessary, gardening can be developed into a full-time occupation, with plenty of demand for reliable, honest individuals. With so many homeowners struggling to manage busy schedules, you'll have a continual demand for your services. In addition, if you live in a region with changing seasons, you may want to hire workers to perform fall cleanup or even snow removal. Plus, some clients may need their greenhouse or office plants tended to year-round. With a mix of regular clients and the occasional one-time cleanup of unkempt properties, you can earn a steady, sustainable income. According to the Bureau of Labor Statistics, you can earn between $18 and $20 an hour. Monthly maintenance schedules with clients keep the bookkeeping relatively simple. The National Gardening Association and American Horticultural Society offer solid online resources for gardeners. Landscape architects can earn even more than a gardener. You'll need a college degree in landscape architecture to build fountains, ponds, rock formations, and irrigation systems. While you may pursue this option in the future, there is still plenty of opportunity in performing the basics for homeowners. Prolonged exposure to the sun can cause health hazards like dehydration and even skin cancer. You'll need to invest in protective clothing to keep yourself safe. Your income may be largely dependent on the weather. If you chose not to work during the winter months, you will have to determine a budget to pay your bills. Marketing Materials: To spread the word about your business and attract your first customers, you'll need marketing materials, from a basic website to business cards. Basic lawn and garden equipment: You will often be expected to supply your own tools, including a shovel, rake, hoe, lawn mower, weed eater, and trowel. Note that a commercial mower can cost around $2,000 but you can start smaller and scale up as your business grows. In a field with such high turnover, reliable performance at a fair rate will put you ahead of most of your competition. Your customer base will take root with your growing reputation, as clients recommend you to others.